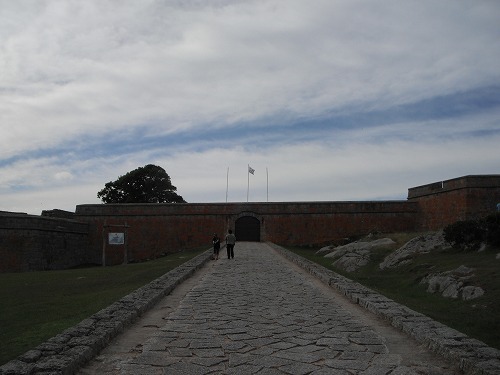 2012.04.17 19ヶ国目、ウルグアイに入国 / The 19th Country on this trip, Uruguay. Today is my mum and nephew's birthday. Happy Birthday!! 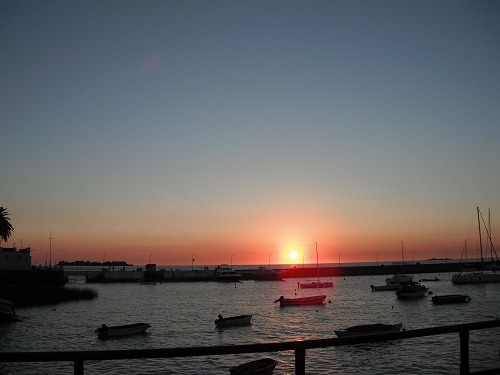 The plan today was to get to Colonia del Sacramento via Montevideo - the capital of Uruguay. 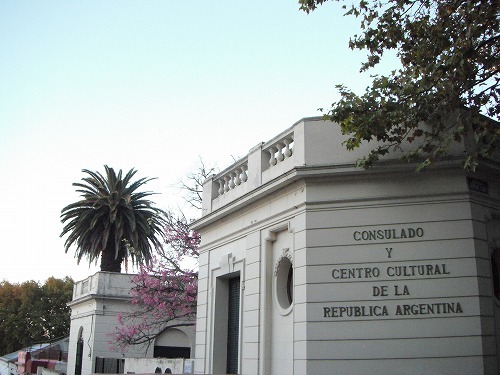 Colonia is the town located on the shore of River La Plata, the oposite side of Buenos Aires. I would take a ferry accross the river and get to Buenos Aires tomorrow. It was overcasted and cool, so it was a nice climate to ride. I got to Immigration at the edge of the town. 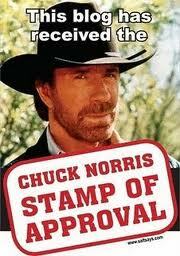 I fill out the entry card and got a stamp. Then I got the temporary import permission fairy easy too. I could leave there around 9am. I head down south on the route 9. 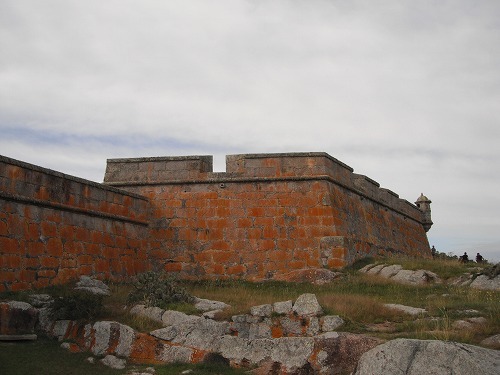 Soon, I saw a sign of "Fuerte San Miguel」 - 18 century fortress built by Spanish against Portugese progress to this area. It was free admission. Nice. Although the size was small, the construction of the structure was good. I walked to the main gate and realised that those cannons could cross-fire the enemies. I could not go inside the fortress as it was to open from 12 noon. 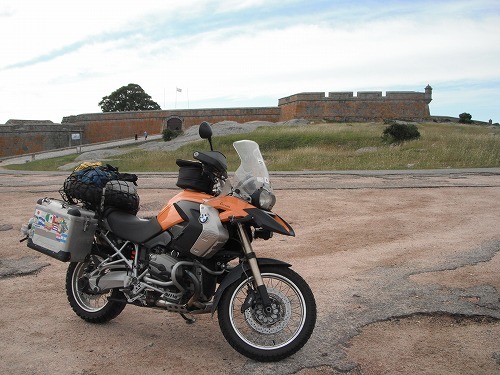 I rode around the fortress and then went back to the highway. The cloud got thicker and it started to rain. It got heavier and hearier. As my rear tyre has no much left, I was nervous to ride. But fortunately I could get through the wet section pretty soon. I fill the tank at Rocha. I should be able to get to Colonia without another refuel. Then I had a quick lunch at Pan de Azucar. I had a ham and cheeze croissant at a petrol station, but the croissant was sweet. 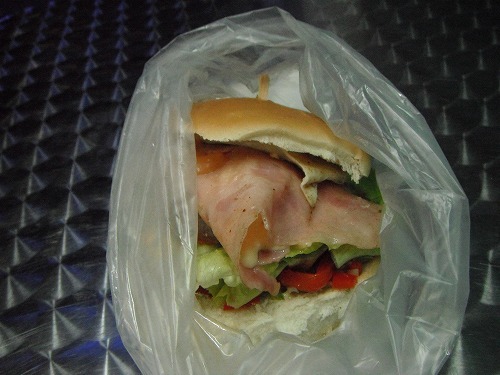 It was a strange combination of a sweet croissant and ham and cheese. But, the town was "Pan de Azucar (sugar bread)"! No wonder!! 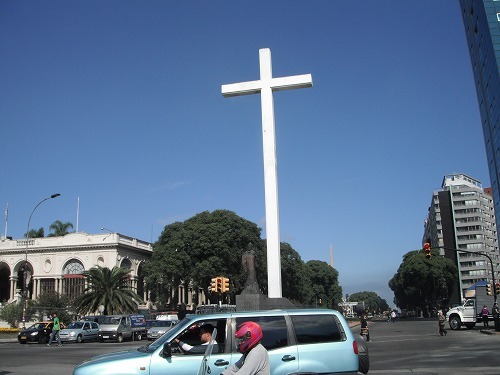 Then I got to Montevideo. Actually it would be closer to get to Colonia bypassing Montevideo, but since I was a kid, the name of this capital caputed my mind. So I decided to visit it. But there were lots of traffic!! I rode throuh the downtown, but it seemed nothing much to see, so I left to Colonia. I toomk the route 1 to the west. I put 2 litres of fuel on the way. I arrived Colonia just after 4pm. I went to the port to buy a ferry ticket. There are 3 ferry operators but only Buquebus does the ferry service for vehicles. Tmorrow morning, there are 4:30am (slow service, 3 hours) and 10:30am (fast service, 1 hour) services to choose. In the afternoon, there is 7:30pm service, which is a little late. So I chose 10:30am service even though it was more expensive. It costs around US$109!! Then I looked for an accomodation. "Hostel Colonial" shown on Lonely Planet could let me park my bike inside the patio, so I chose to stay there. 1 dorm bed costs 350 U Pesos. I waled around the downtown before dusk. 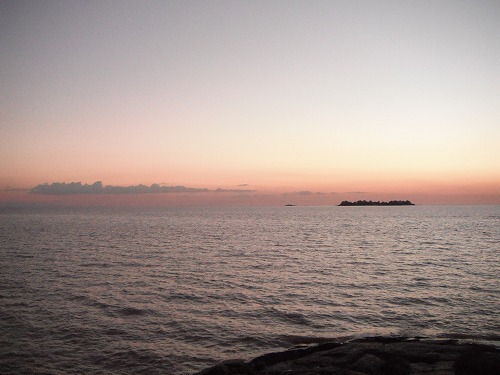 Then I watched the sunset from the jetty. I could see the sun setting over the river. Yes, the river La Plata. It's not a sea. The other side is Argentina but I could not see the shore. I had dinner at a street stand. Choripan Uruguayan style. Look at the volume of the Choripan! In the evening, I met Alex from Germany staying at the same room. He is a nice guy! I will be back to Argentina tomorrow. 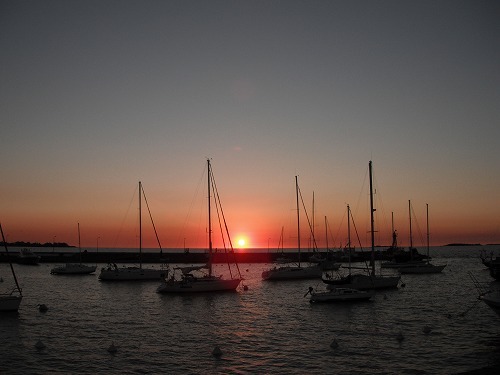 The ferry will be only 1 hour ride, so I would not be able to relax on the boat. 19ヶ国目、ウルグアイに入国 / The 19th Country on this trip, Uruguay. 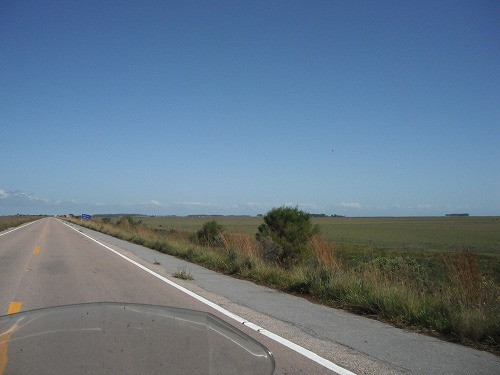 Today I was to enter Uruguay. Plinio did not come to teh apartment this morning. He might be busy with other things, I reckoned. I left the apartment by 8:30am. 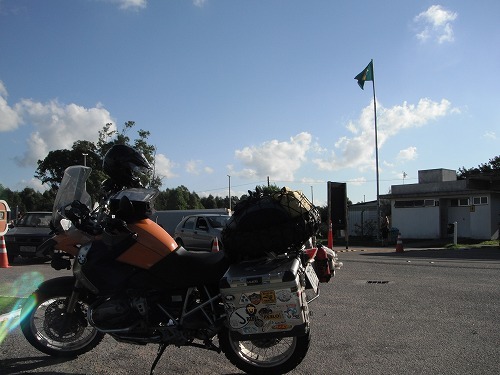 To Pelotas, 200km or so, the freeway was very boring. 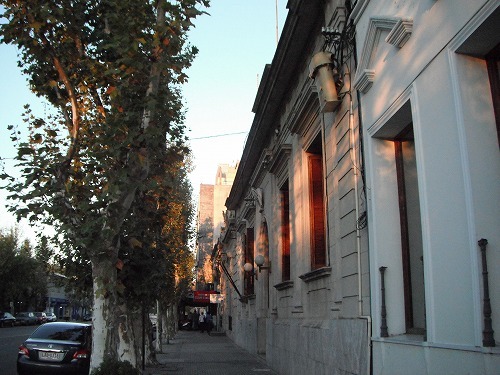 I refelled at Pelotas and headed to Chui, the border town to Uruguay. 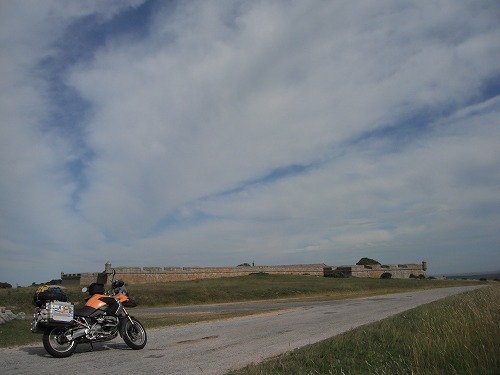 I saw a sign stating "600km to Montevideo" the capital of Urguay. 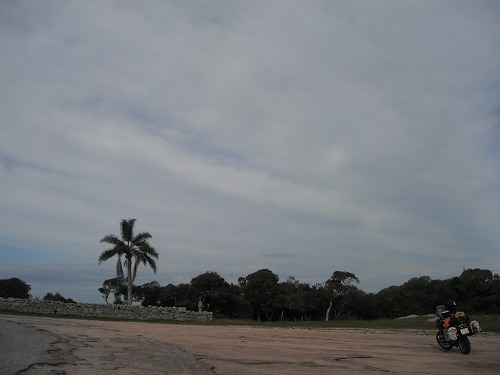 The way from Pelotas to Chui, it became more boring than before. Some swamps, cattle farms and farms. The scernery wasn't that bad at all. But as there were many animals crossing the road, the speed limit was 60km/h!! And there were many speed cameras. I had to be careful with my speed. The view was like. Not bad at all, isn't it? There were some carcassess of animals on the road, and they stunk!! There were birds like eagles eating those carcasses, and when I approaced, they flew away. So it was dangerous too. No wonder the speed limit was 60km/h. There was immigration / custom office before the town of Chui. 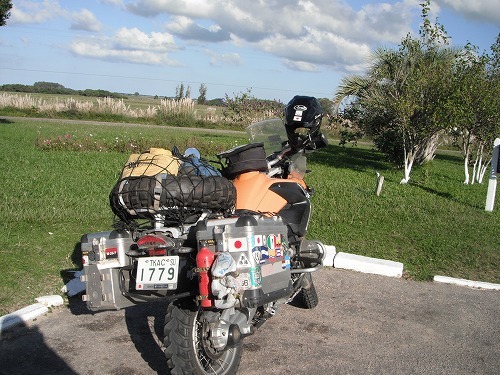 I stamped out Brazil and cancelled the temporary import of my bike. I don't know why but it took around 20mins at Custom to cancel the permit. It was just before 4pm. Then I entered the town of Chuy. Well the town is spelled Chui in Brazil and Chuy in Uruguay. The town looks like located in between the border of 2 countries. It is the tax free zone and it has a little chaotic atmosphere to me. Oh, now I entered Urugua, the 19th country on this trip. I went to a money exchange to exchange Reals to US$ and Uruguay Pesos (I got US$529 and 2,235 U Pesos). I decided to spend 1 night here but I wondered if I should go through the immigration or not, so I rode to the edge of the town where immigration / custom office locates. The officer told me that if I would stay in Chi onight, I could come back there tomorrow to do the immigration process.